I’m a story teller. I try to tell about the past as it was during my childhood. So, once again I’ll attempt to let you go back in time just a tad. Have a good trip. As a kid most of my summer evenings, especially those on the weekends, I’d like to sit on the front porch with the adults and listen to their conversations. The old people in particular were the ones I enjoyed the most. Never crossed my mind that the time would come when I’d feel a need to remember those long-ago, warm, honeysuckle-laden evenings. On some evenings the old folks would invite me to add my opinions to their conversations. Being recognized and called upon by your elders was an honor not taken lightly. My Grandpa Cole (pronounced Co-lee) would sit back in a straight-back chair, clasp his hands across his lap, and watch. He never hid his disdain for me. Whenever present, he would end my participation post haste. To his way of thinking I was just a dumb kid. It soon got to where the old folks avoided me. They’d learned what resulted if they talked to me. When Cole wasn’t around it was a different story. Many nervously joked with me about his attitude toward me. I learned to stay out of his way. Uncle Jerry and the train robbery came up during one of these front-porch forums. My dad’s Uncle Jerry had helped a man from Mississippi rob a train or two. Some years later my Aunt Verda somehow got a copy of the Frisco Railroad newsletter. The newsletter contained re-prints from old newspaper stories about the robbery. I’ve tried to recount the story many times but without Verda’s newsletter there was never quite enough proof to have it come off as real. My computer is a wonderful tool and information source. 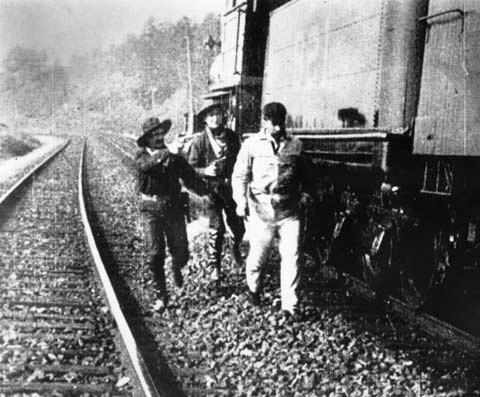 Just for the heck of it I had Google search for “Jerry Ennis train robber.” Low and behold, he was in there. If you want to read about Jerry just Google him. My Grandpa Henry had four brothers — Jerry, Thad, Early, and Geemer. Henry lived to one hundred and four years of age. Jerry died at eighty. Suffice to say the other three had untimely deaths caused by the wicked lives they led. All three were felled by gunfire. Jerry fathered one daughter. Henry father three daughters and two sons. He out-lived all but one. Another great reminiscence! Wow, what a colorful family! I like the part in the article about Uncle Henry being initially arrested for the robbery, maybe because Jerry gave him $1,000 from the loot. Also, if I can be forgiven for saying so, it appears that Jerry may not have been the brightest bulb on the tree if he accepted that his share of the haul was only $9,000. It’s a great story, and I really enjoyed it. Thanks, Larry! My grandfather is James Oliver Ennis ‘Geemer’. He died at the age of 88 of natural causes in the Carbon Hill Nursing Home in Carbon Hill, AL. He had lived in our home prior to being placed there. He had seven brothers. Most of them, except for Homer, died late in life. Another brother, Jeffrie Owen, died at the age of 92. The remaining brothers died either in their 70’s or 80’s. Requards to you and your family. I am a granddaughter of Eula Enis Duke, who was a sister of these Enis men of whom you speak. I have heard these stories all of my life and would love to find some family members who know more. In 1968, Robert Elman’s classic “Fired in Anger” has a chapter on the gun used by Barney Lewis. Railroad Detective E. W. Starling (he was investigating an epidemic of train robberies in MS and AL from 1905 to 1913) believed that Lewis had been involved in train robberies and murders of railroad men in MS, but lacked evidence for indictment. Starling is, also, credited with Lewis’ capture and the capture of Billy Miner and Jerry and Henry Ennis. I need to correct one part of this article. Jerry Ennis fathered two daughters. Della Audrey Ennis was the oldest and then Mary Ellen Ennis. Della is my grandmother. My grandfather told me yesterday about his late wife’s (and my grandmother), Winter Ann Lewis Toney, uncle or maybe great uncle, Barney Lewis, who robbed a train. I love learning about my family history! It’s so neat to connect with the past.